LISTEN NOW! John, Greg, and Pat discuss a new movie to come out in 2014 that is based upon a true story and is adapted from a book that chronicles a young boy’s divine encounter with God. 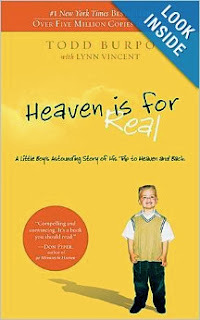 According to the book’s website “Heaven Is for Real is the true story of a four-year old son of a small town Nebraska pastor who experienced heaven during emergency surgery”. One of the things that the young boy, Colton, experience was seeing his sister in heaven who had died in his mother’s womb who he had no natural knowledge of. His encounters are filled with many encounters like that. They further discussed how many want to go to heaven but they need to know how to get to heaven and that’s only by receiving Jesus into your heart as Lord and Savior. They further discussed the untold millions of aborted babies that will be seen in heaven as they encourage us to seek forgiveness from God if we have either had or supported abortions in our past. We will come face to face with the decisions that we have made better to make it right with God now. Heaven is real and you can go there, but you have to choose to want to go there by accepting Jesus into your heart and life.